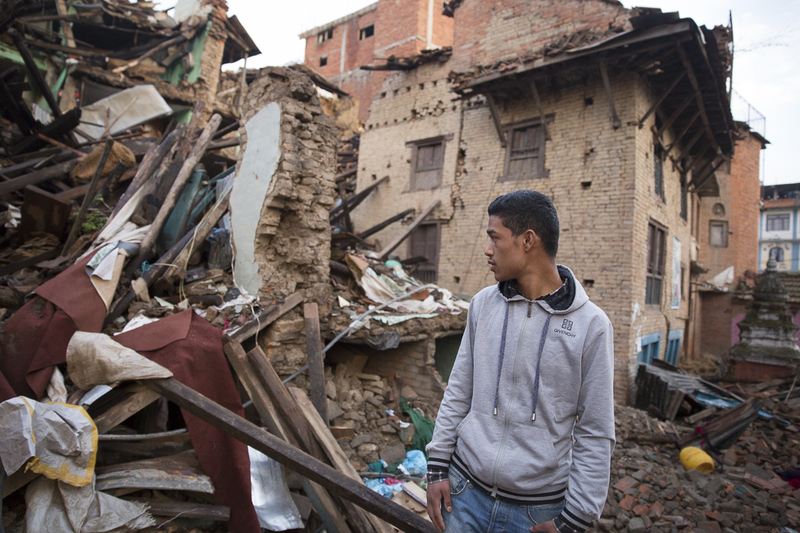 Prashant Singh, 17, stands in the spot where his grandmother died in the earthquake. She was eating breakfast on the morning of April 25, when her house crumbled. “She was beautiful and she loved me very much and my sister,” he said. 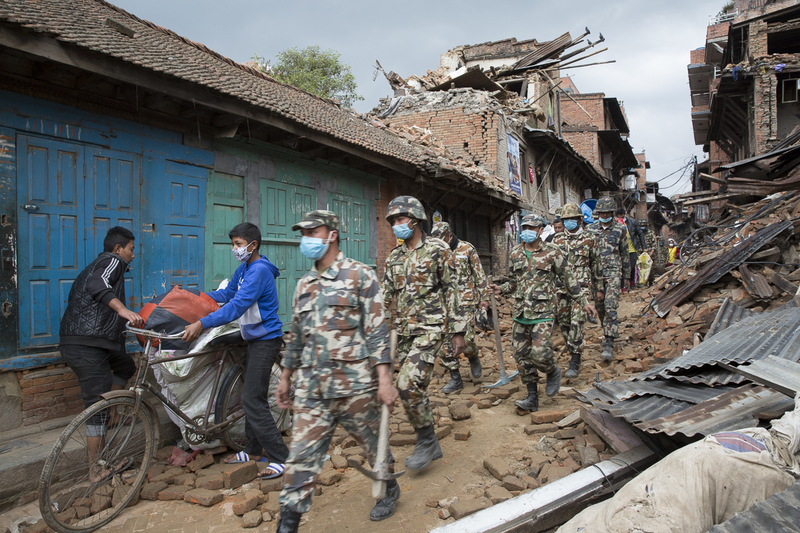 Samaritan’s Purse disaster response team members are seeing heartbreaking scenes in Nepal in the aftermath of the 7.8 magnitude earthquake that rocked the impoverished Himalayan nation on April 25. 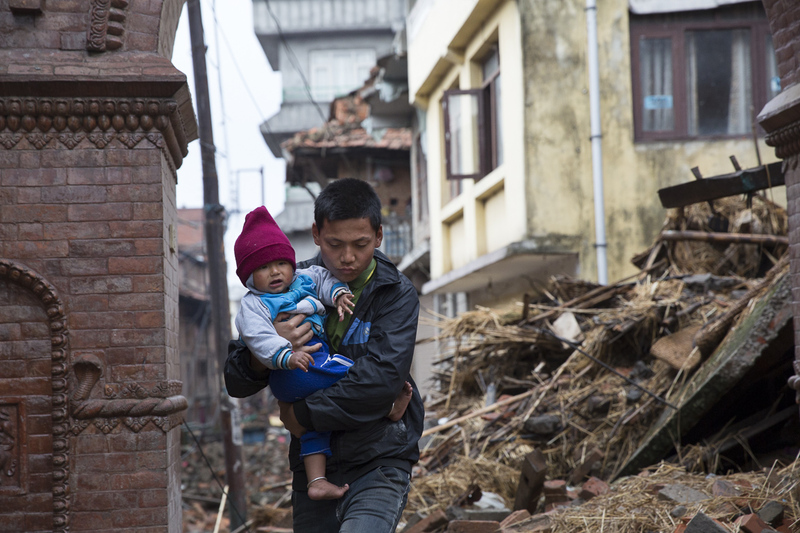 Our staff is in Nepal to provide emergency shelter, food, clean water, medical care, and meet other urgent needs for victims of the terrible disaster. 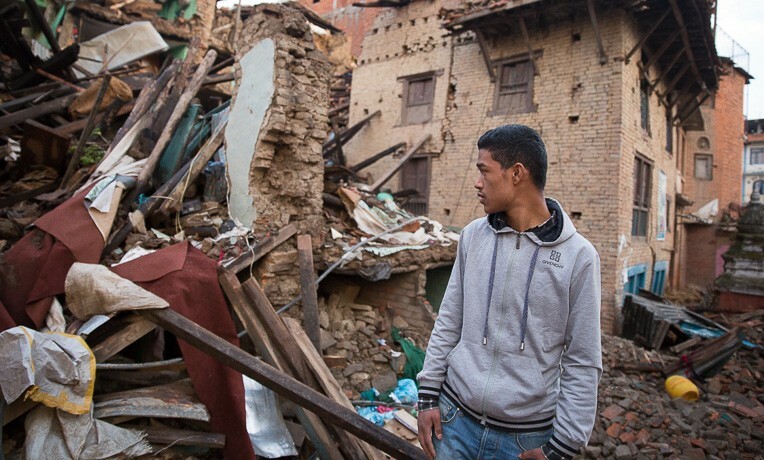 As they assess the damage and determine where to work, they are witnessing incredible destruction, death, and tragedy. 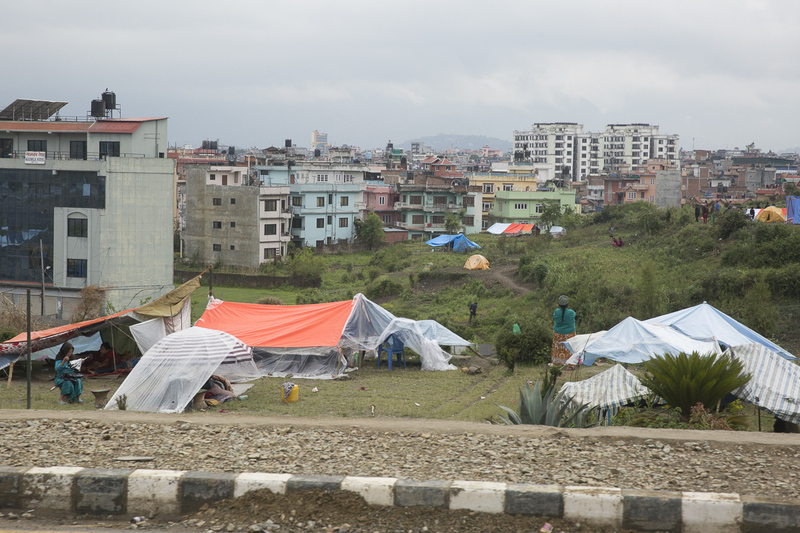 As aftershocks continue, people are sleeping outside in tents in the rain and mud because they lost their homes or are petrified to stay inside. Buildings have collapsed, debris clogs the streets, people are still unaccounted for, and the death toll is rising daily. The reality of the severe loss is still being uncovered. More than 5,000 people are known to have died, and there are fears that number could double as officials dig through the rubble. Over 8,000 were injured. At least 70,000 houses were destroyed. An estimated 2.8 million people have been displaced, including hundreds of thousands who are afraid to return to their houses. Some 8 million people have been affected. There is not a simple fix for this mass of broken things and broken lives. But our team is here to meet needs for people desperate to survive right now. We are here to look them in the eyes and tell them they’re not alone and healing is possible. 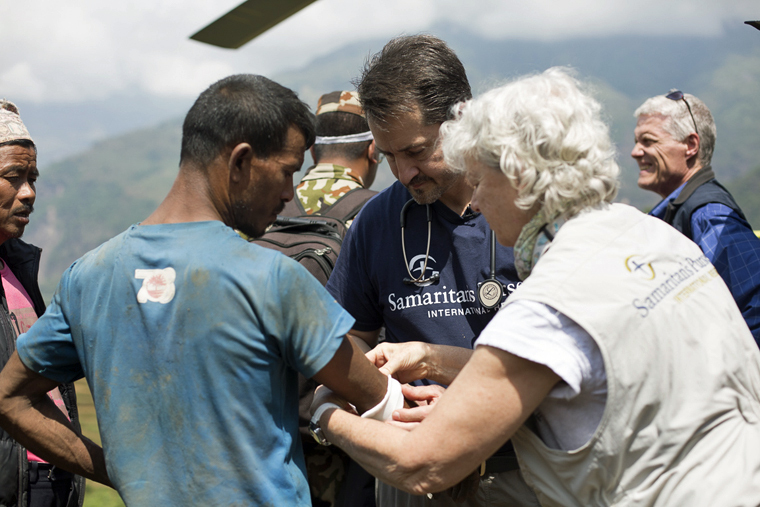 Dr. Lance Plyler, head of the Samaritan's Purse medical team, treats patients at a mobile clinic in a remote village. 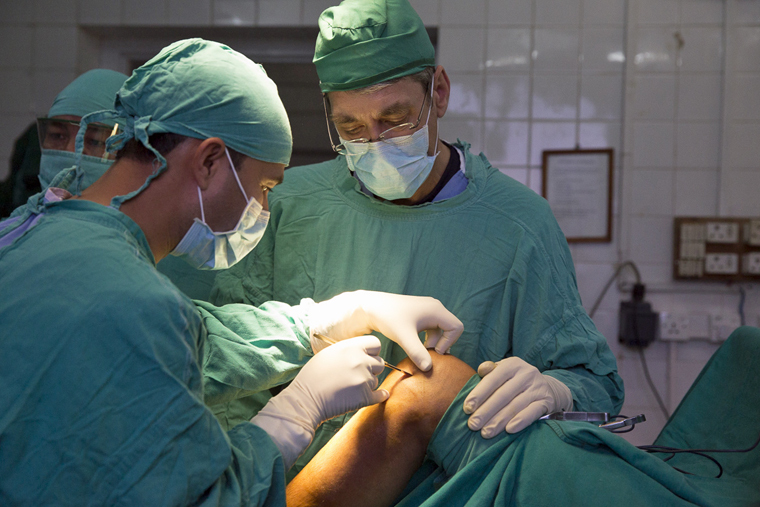 Dr. Lee McCluskey, the team’s orthopedic surgeon, worked with Nepalese doctors to conduct operations at Anandaban Hospital in Kathmandu. Military are searching the area for survivors and to pull bodies from the rubble. 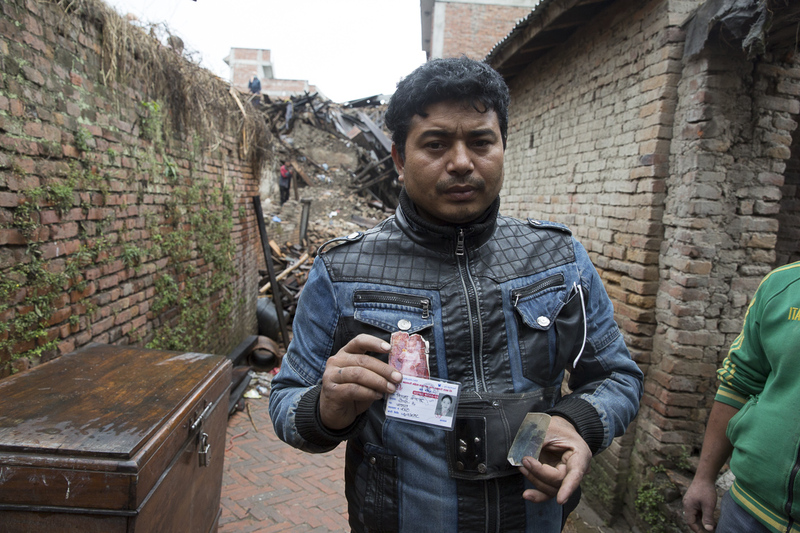 A man holds onto pictures of his wife and child who were killed during the tragic earthquake that crumbled his home in Bhaktapur. The newly homeless take refuge from the rain wherever they can. 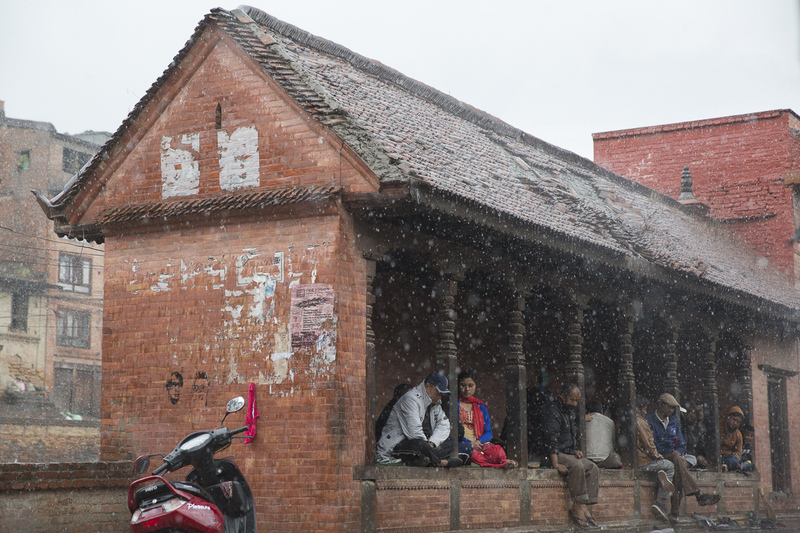 The monsoon season is quickly approaching, and hundreds of thousands of people are in need of shelter. 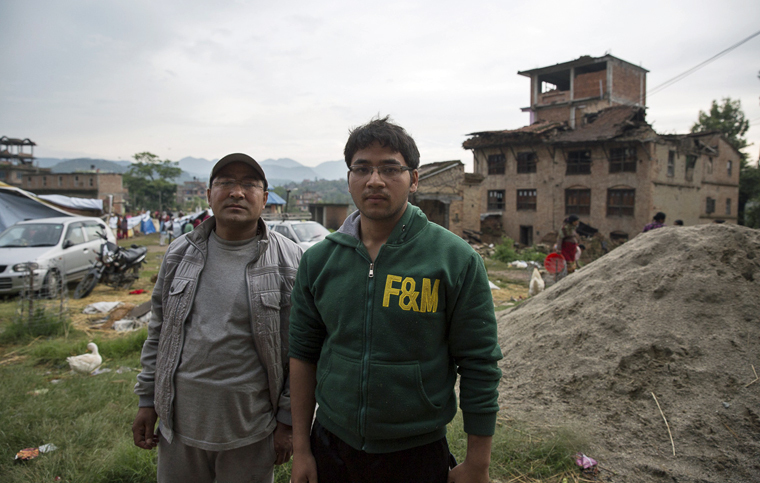 Prashant Singh, 17, stands in the spot where his grandmother died in the earthquake. She was eating breakfast on the morning of April 25, when her house crumbled. “She was beautiful and she loved me very much and my sister,” he said. Families are now living in makeshift tent camps. 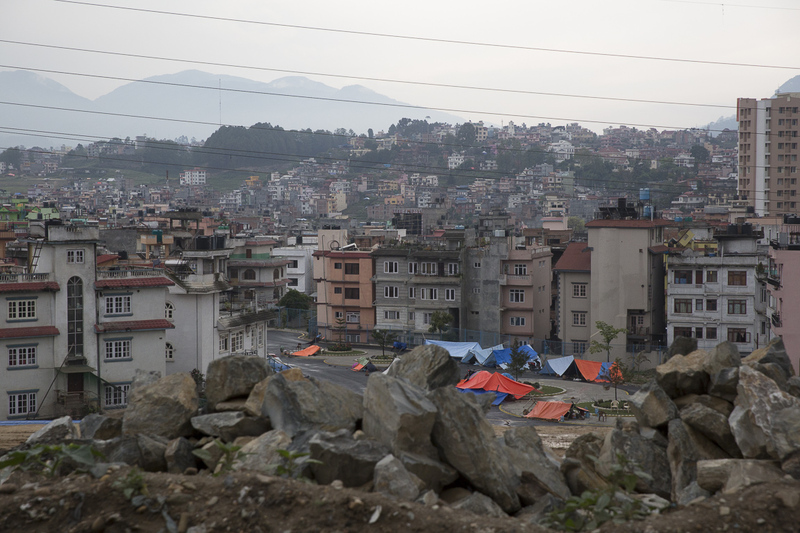 In the Kathmandu Valley, displaced families take refuge under plastic tarps wherever they can find space to set them up. Thousands of families have been sleeping in tents outside either because their homes are destroyed or they are terrified that the aftershocks will cause their homes to fall down on top of them. It has been raining frequently, and some people don't have any other option but to sleep out in the wet mud. 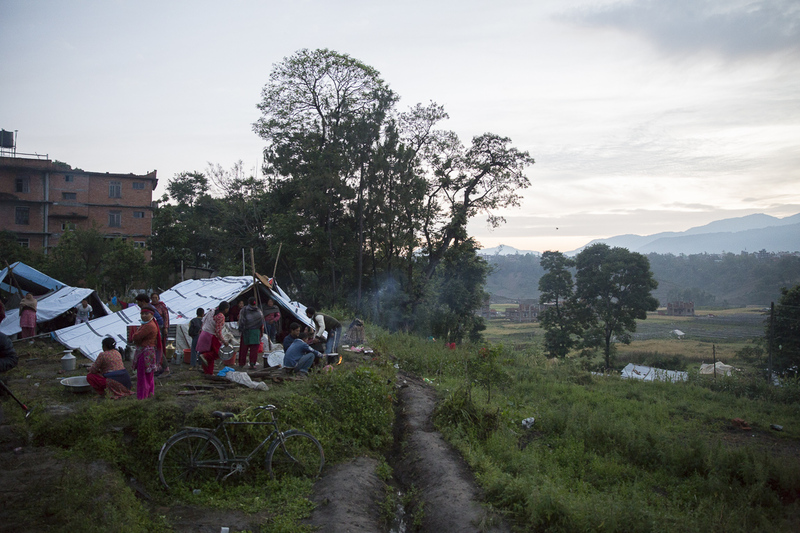 Disaster response team drove four hours into remote mountainous villages to the northwest of Kathmandu to identify families in need of help. As our team works with church partners to meet needs, we hear the stories of the survivors. 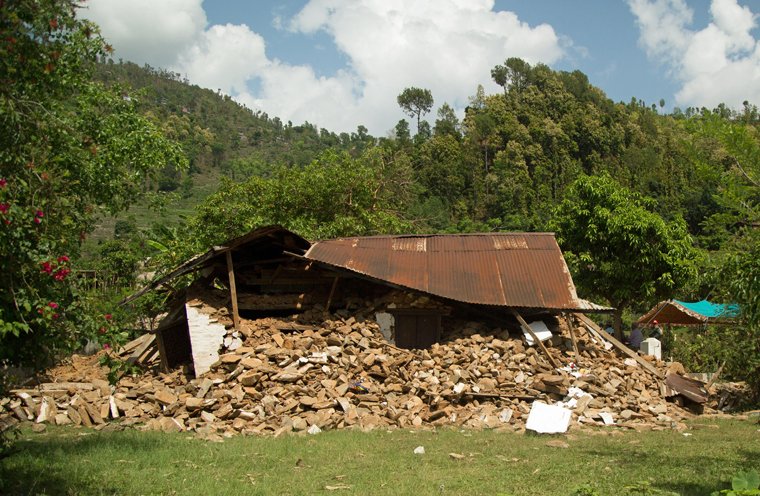 They are people like Nanda Gopal, whose home was destroyed by the quake. 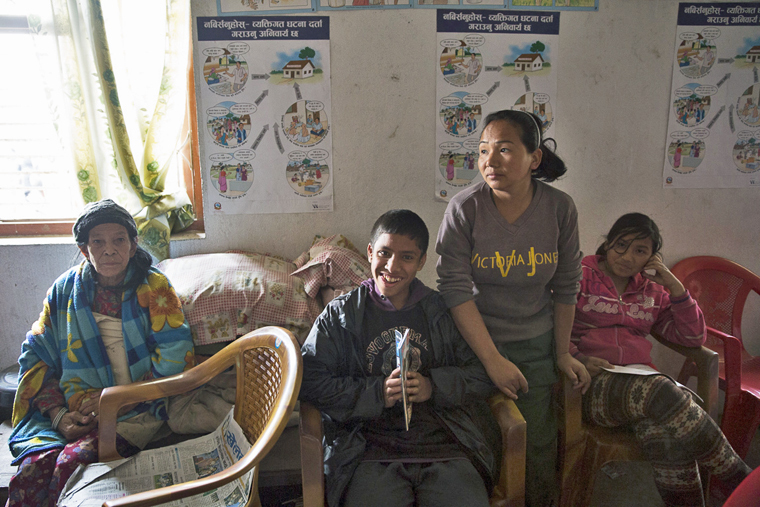 Nanda and his family have been organizing a tent community in their village. The majority of people here work as farmers, craftsmen, and taxi drivers. The earthquake destroyed 75 percent of their homes and killed 20 people. Nanda Gopal (left) and his son, Binay, in the ruins of Harishidi village. “Everyone was silent and there were no smiles on their faces for two days,” said Binay, 23, Nanda’s son. He became emotional after talking about the children who lost their lives—specifically a 3-month-old that passed away in the arms of her mother who fell from her house during the earthquake. Our team also met Kumari K.C., who is living in a government building with her mother and two children since the earthquake damaged their home. When the trembling started, Kumari took off running from her job in a hospital back to the village to find her son and daughter. On the way, it looked like whole villages were collapsing, and she had little hope that her children would make it. “I ran to the village with tears in my eyes. I could barely open them because of tears,” she said. Kumari K.C., with her mother, and two children. Kumari also worried about her mother, who has breathing problems. The air was so thick with dust and debris. 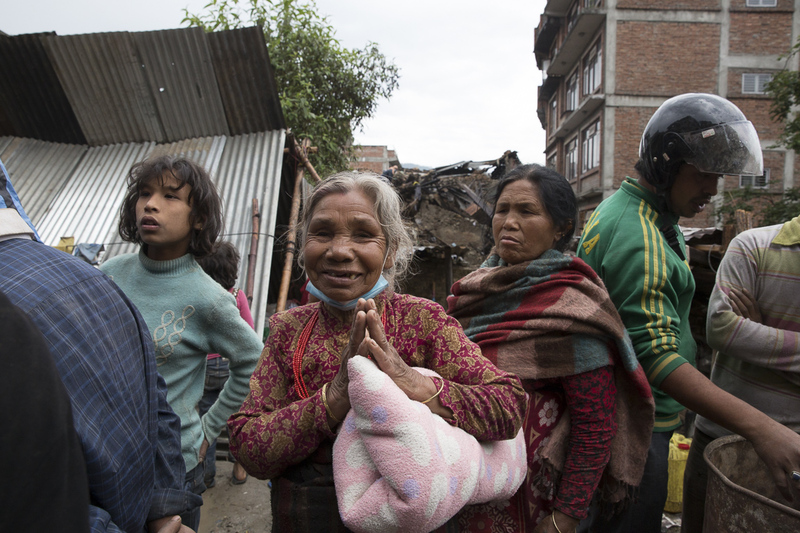 When she arrived home, Kumari found her family was unharmed, although their home was destroyed. “I have nothing left, but I’m happy that my family is safe,” she said. Samaritan’s Purse will be helping people like these. Airports are jammed going into Nepal, and access is challenging, but an initial airlift of 60 tons of relief supplies is expected to arrive on Thursday. We are sending initial supplies for 15,000 households, and anticipate doing more as the response continues. 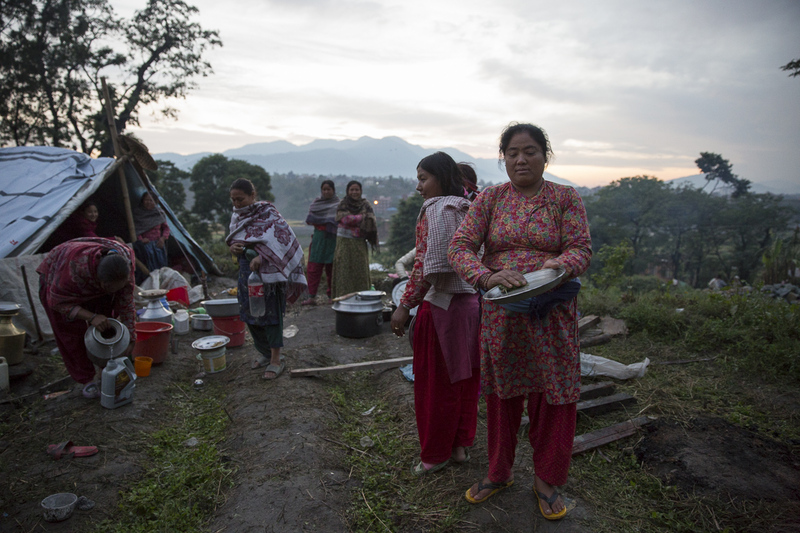 In the coming days and weeks, Samaritan’s Purse will be reaching thousands of Nepalese who need roofs over their heads, safe water to drink, and treatment for injuries. This is the work of the body of Christ. Thank you to all who are partnering with us through prayer and support. 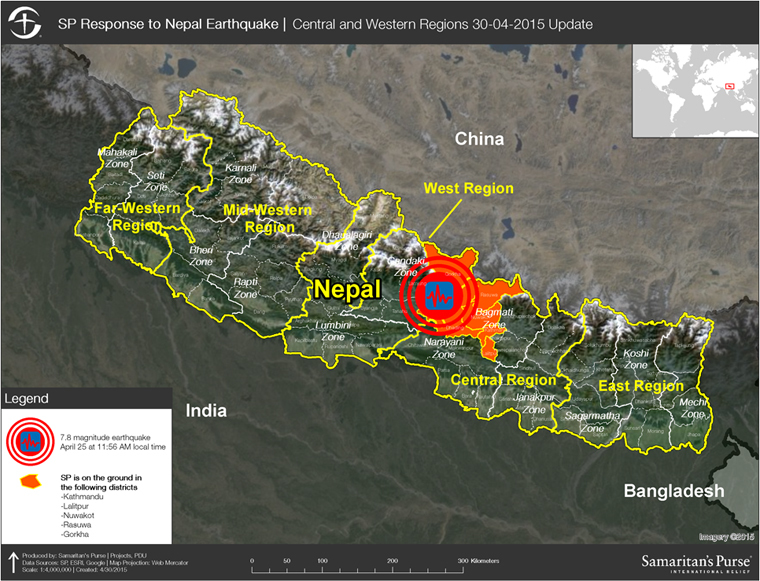 Please continue to lift up the people of Nepal and trust in the redemptive power of God in the middle of this tragedy.